Transparency International (TI) has published their annual survey of corruption perceptions — how corrupt various countries are perceived to be. As usual, India does not fare well. What’s particularly disturbing, though, is what the data now reveals. TI publishes two things: a “score” which, on a scale of 1-10, measures corruption, and a rank out of however many countries were evaluated – 183 countries in 2011. A score of ten would be excellent, but no country gets that; New Zealand tops with a 9.5 (and the US gets only a 7.5). On that scale, India gets 3.1, which gives it a rank of 95 out of 183 countries, in company with Albania, Kiribati, Swaziland and Tonga. What is now noticeable, with the extra two year’s data, is that there’s actually a trend that started in 2008. In the wrong direction. What I’ve done in the graph is show a normalized rank to adjust for changes in the number of countries TI has evaluated. That’s the red line, and lower is better. Here, India’s position initially improved. I’m guessing that the newly-added countries each year tended to score low, thus pushing India’s normalized rank up. The number of countries grew from 90 in the year 2000 to 183 in 2011. 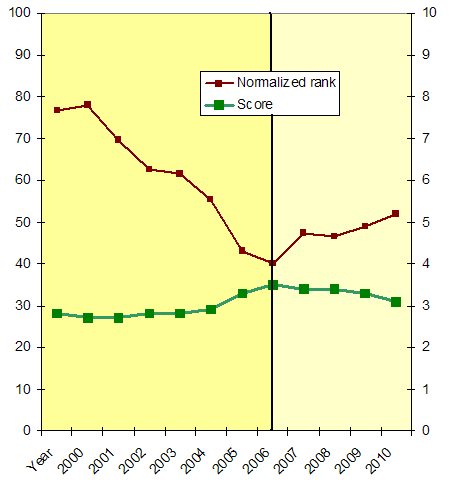 But by 2008, the number of countries in the study had stabilized around 180… and India was drifting down in the rankings. The green line is the score for India. There, higher is better. There did appear to be a very gradual upward trend there too – which ended in 2007. Since then, it flattened and then started to slide. China hasn’t got much better than it was in 2009 – it had a score of 3.6 and a rank of 79. It’s kept the same score in 2011, but that’s yielded a rank of 75. This entry was posted in Asia, Doing Business in India, Economy and tagged corruption, Doing Business in India. Bookmark the permalink. Does it take into consideration quantum of corruption? For example an official could have been satisfied by bribing Rs 10/- to do a job, but today for doing the same he may demand as high as Rs 10,000/-. My own personal feeling is – when reforms were introduced first time in 1990 and software boom picked, many people in IT sector got salaries which by US standards could be say US$1500/- but in 1990 it was Rs 37,500/- while in non-IT sector same person would have earned just Rs 5000/-. So eye balls opened wide. So everybody wanted a similar share of easy money. I still feel Money / hour as wage is just notionally kept high by US and obviously gets linked to exchange rate too. Hence a person not getting such salaries (do not think it applies to Government sector alone- it’s in private sector too – compares himself to his counterparts and demands higher- whether the company is capable of paying or not. Basically you can trace the roots to globalization and unlimited greed..